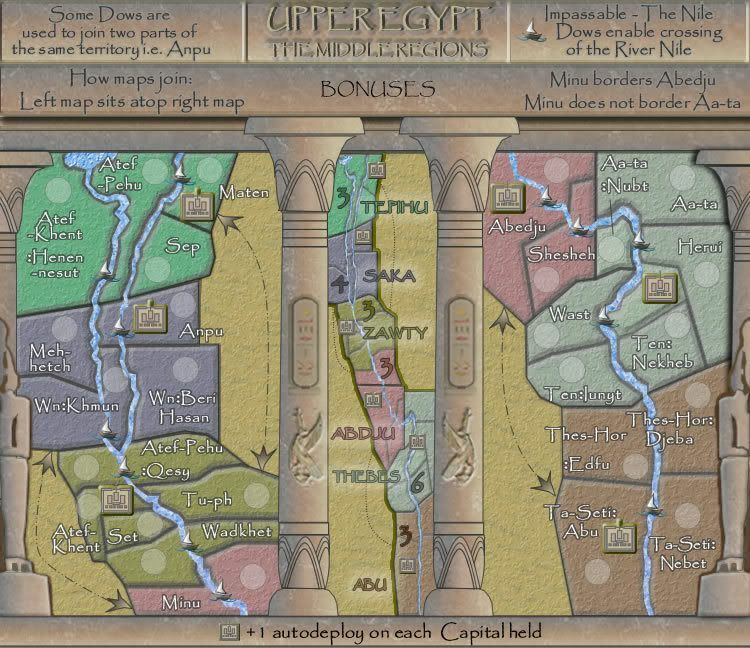 Re: EGYPT UPPER V9 (P7) [I] - Comments please! Your colon placements for names that span two lines are inconsistent. Sometimes the colon goes on the top line at the right, other times on the bottom line at the left. I think all colons should be on the top line a the right, personally, but they should definitely follow a uniform style. I don't really like the outline on the minimap. Could it be made thinner? The part of the title that says "The middle regions" is a bit hard to read. Could you give it more of a shadow or make the background of that area a bit less bumpy? s dopne like that because in some places it doesn't fit either on the top or bottom, but i'll try to make it more consistent. That's been done as a request so i'll see if others don't like it. although (and im just spitballing an idea here) for the territories with capitals, could the army numbers be on the capital images? No...that would create an inconsistency with the other maps. sorry bryguy...i'm not in favour of doing that. I'd prefer the capital icon to remain that rather than an army shadow. Last edited by cairnswk on Sun May 04, 2008 5:06 pm, edited 1 time in total. Re: EGYPT UPPER V8 (P6) [I] - Comments please! Last edited by cairnswk on Wed May 07, 2008 5:30 pm, edited 1 time in total. 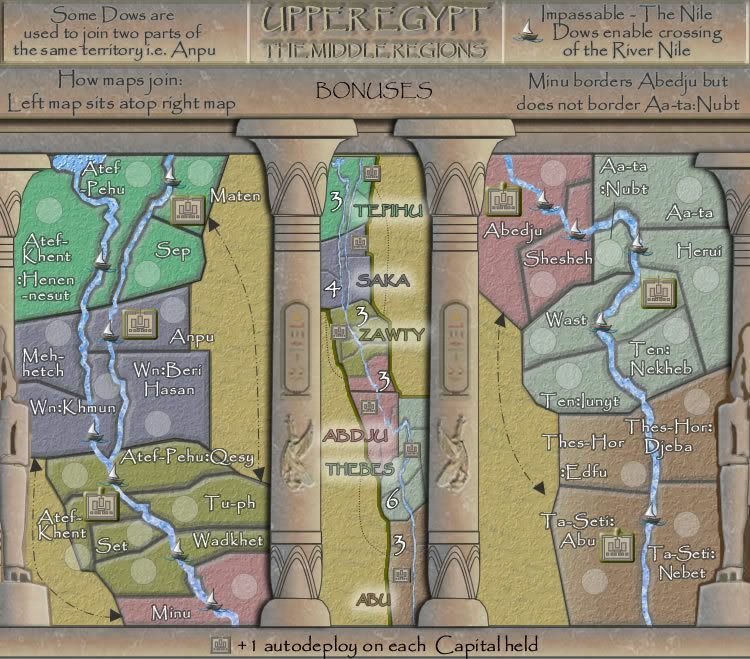 - The bonus text is once again blending into the territories they represent (Lower Egypt had this problem, remember? ). Since you're strapped for space this time, I would suggest making the stroke or glow around the text a bit more bold. - The arrows pointing at the bonuses are superfluous, as it's rather obvious it's the bonus description in the middle. - The winged creatures on the bonus pillars are blurry and look out of place next to all the other crisp detail you've put into the map's look. - The two statues at the edges of the map are positioned in different places relative to the edge. Suggest moving the right one further right by a pixel or two to make them match up. - "Note that" is superfluous and doesn't fit with the rest of the map's descriptions. Suggest changing the paragraph to simply "Some Dows are..."
I'm liking the Egypt maps - visually this may be my favorite so far. it took me a few minutes to wrap my head on exactly where the attack routes go from map to map. Because the northern border of Aa-ta-nubt seems to be cut-off by the graphics rather than being actually shown it seems to me like it should be able to attack something to its north, or continue to extend and sit next to Minu. Perhaps you could fashion the outside borders of each territory to be less perfect? And some kind of indication on each map as to what can attack what might be needed... something as simple as an arrow or even showing part of the other territory bleed across on to the other map. Attack arrows - haven't read the entire thread so forgive me if you'll be working on them, but they seem out of place to me. Maybe just a road connecting the territories? As is I wonder why you can cross the desert to attack somebody five territories away, but not three territories away. Broken territories could be problematic, but i don't have a solution for that right now. I suspect somebody is going to be surprised that Anpu can attack WnKhmun, for example. oaktown wrote: I'm liking the Egypt maps - visually this may be my favorite so far. oaktown, the problem there is that the bottom of the middle left column hides the connecting borders. I really don't know what to do with that but will try to experiment. Taken care of in the instructions above that area. Well attacking across the desert would have be used I am sure rather than stick to the Nile River where all movements would be noticed. It really doesn't matter where the attacks, I have used those territories for gameplay, and to losen the map up the same with the sea routes in Lower Egypt. Note that some Dows are used to join two parts of the same territory....i have added Anpu as an i.e. Other changes made to the map are in the height of the map and the way the columns relate to the dimensions of the perspective of the map. TaCktiX wrote: - The bonus text is once again blending into the territories they represent (Lower Egypt had this problem, remember? ). Since you're strapped for space this time, I would suggest making the stroke or glow around the text a bit more bold. Left the winged Gods as they were and added a gaussian blue to the cartouches. "Note that" has also been removed. The arrows i will attend to next version. Thanks Guys. So this is a re-worked Version 9 from changes above. Bloody photobucket has gone down. Re: EGYPT UPPER V9 (P8) [I] - Comments please! - The bonus numbers seem just "shoved" there somewhere on the region. Because the region names have adequate space near them for a single number, perhaps move the numbers and color/effect them the same way as the region they belong to? - You moved both statues 1 px toward the edge, keeping the same problem. One statue needs to move, not both. Moving the statues, i did not move both. I moved the left one. The number i will look at. That outer glow of the continent names could probaboy do its duty while not being so strong. A little more transparency should do the trick. On another note I think this is my favourite of the edgyt maps from a graphics point of view. gimil wrote: That outer glow of the continent names could probaboy do its duty while not being so strong. A little more transparency should do the trick. Lovely gimil,. thanks! all done in Fireworks btw. 1. Expanded the width by 10 px to 590 to allow some space on the left side of the map. 2. the statue on the left is an exact copy of the statue on the right with it's shadow removed coz the light comes in from the right. 3. the shadows on the two middles columns have been removed coz they are perspectively out in front of the maps and probably wouldn't cast a shadow back that far. maybe this is silly, but could you remove the but after "Minu borders Abedju"
I can imagine players asking where Abedju but is on the map since there's other names with similar letter placements on this map. edbeard wrote: maybe this is silly, but could you remove the but after "Minu borders Abedju"
It isn't silly, its a difference opinion, I can do that easily. While i was at it, i changed the tones in the back left column to be a little darker given it would be under a shadowed area there. Please refresh your browser to see the changes in the version 10 images above. Is it just me or does Abu seem to have a gradient on it while none of the other continents do? ZeakCytho wrote: Is it just me or does Abu seem to have a gradient on it while none of the other continents do? Minor suggestion. Perhaps a little more decoration and elaboration on the "Bonuses" text. Also, "The Middle Regions" looks oddly faded or blurry...perhaps you could bring it out a little more? AndyDufresne wrote: Minor suggestion. Perhaps a little more decoration and elaboration on the "Bonuses" text. Also, "The Middle Regions" looks oddly faded or blurry...perhaps you could bring it out a little more? How does this look Andy? I've used the Lotus Flower from Lower Egypt as a continuing theme to enhance that section, and THE MIDDLE REGIONS is enhanced also. Re: EGYPT UPPER V11 (P9) [I] - Comments please! Looking better already! I like the new Bonuses. Perhaps a shadow behind Middle Regions and Bonuses, similar to the above title, but it may not be necessary. My eyes just may not like lack of distinction! AndyDufresne wrote: Looking better already! I like the new Bonuses. Perhaps a shadow behind Middle Regions and Bonuses, similar to the above title, but it may not be necessary. My eyes just may not like lack of distinction! But Andy, i just pulled the shadow off those names coz you said they was too blury! !